Tony: 7 – If it wasn’t for Victor Vazquez – Chris Mavinga would have been the hands-down signing of the season. Sure Mavinga looked a bit like a giraffe on ice for the first few matches but after the early struggles he found his way. And how. The big DR Congolese international (DR Congo is the cool Congo because it’s also a doctor) not only became useful but he became a stalwart on TFC’s defensive unit. By mid-season, Mavinga was an automatic choice on Vanney’s starting elevens and he was letting everyone know how happy he was. After patchy spells across Europe he had seemingly found a home in Toronto where he was quickly winning over supporters, his online love for being in Toronto is adorable even to the most cynical. Duncan: 7 – Alarmingly bad in his first game, but got more chances and ended up looking really good. Did the basics well, and most of his highlight moments were of the good kind, not always the case for defenders. Used his speed to make a lot of last ditch tackles, sometimes necessitated by his own mistakes sure, but just as often covering for his teammates, or simply stopping a good play from the opposition. Hope he’s back next year. Kristin: 5 – TFC’s best defender last season – and possibly the league – no really, I’m not kidding and no I haven’t stopped loving Justin Morrow. After the rocky start he was immense for Toronto throughout the season. Fast, smart tackles, tracking back, and more often than not in the right place at the right time. Outside of VV he was the biggest difference and best signing that the team made. Mark: 9 – So good and such a surprise package for the season. Aron: 8 – I wanted to hop on the field and give him a fisherman’s suplex during his first game. Sometimes too fancy, but not deserving of a wrestling move. YellingAtSoccer: 6 – Came up solid in defence this year. TweetKred: 6 – What a pickup. If not for Vazquez he is the pickup of the year. Just amazing coverage of the whole back line. The perfection on tackle timing saved so many goals. And he looks like he’s just having so much fun out there. Mel: 12 – I like that he’s not afraid to get stuck in and mix it up a bit if needed. Mr. Tuktoyaktuk: 7 – Took him some time to settle in, had a big second half of the season. James: 7 – Mavinga was very much an under the radar acquisition in the off-season. He had the pedigree, but just how a player who seemed to have fallen off the map would translate to MLS remained to be seen. It took him a little bit of time to get his feet under him, but once he did, one could argue that there was not a better defender in the league. Quick, not afraid of a crunching tackle, and possessing an uncanny ability to get a foot on the ball, cleanly, when others could not, Mavinga has been a masterful addition to the side. JordyLike: 5 – Rough start, but transformed into arguably one of the best CBs TFC has ever had. Consistently great tackler and never a guy I doubt when left one on one with an attacker. TuffyRocks: 9 – Great defender and has speed. MarkHSV: 6 – So many amazing recoveries and tackles from Mavinga. Was pretty worried to get another European central defender, but after a slow start, Mavinga really delivered. Jen: 2 – So here’s a thing that matters: during celebrations, Chris Mavinga takes every trophy on a walk up the pitch to recognize the supporters in every section. I don’t think he gets recognized for that, but he should; I’m going to do my part and artificially inflate his ranking. From those of us outside the south end: thank you, Chris. Artur: 6 – Very underrated and not enough credid given by the media. This defender belongs with the big boys in EU. Martyn: 6 – Was 0.5 seconds away from 20 penalties this season. But those combined 10 seconds saved 20 goals. Finally a TFC defender that walks the dangerous line and doesn’t step on a rake. Every. Damned. Time. Jeff: 8 – Welcome to BMO – shat the bed vs. Atlanta and then only got better and better. Another guy with a great attitude and seems to love it here. Athletic, strong, confident – everything we hoped Doneil Henry would turn out to be. Steve G.: 4 – Its a tie between Vazquez and Mavinga for the 4 spot. 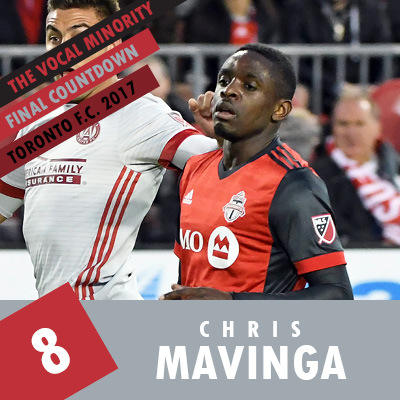 The truth is that I am willing to listen to and accept either argument: a) that the addition of Mavinga was the single best addition to any MLS team this season as he was without a doubt the leagues best defender this season and the biggest difference between the 2016 and 2017 Toronto FC teams. OR b) the addition of Vazquez was the single best addition to any MLS team this season as he either scored or assisted on the game winning goal more than any other player in the MLS in 2017 and was clearly the difference in the MLS cup finals vs 2016 as Seattle had no answer for what he had to offer in the MF. Like I said, I will accept both narratives as truth. Alex: 7 – After a rough introduction into MLS play, developed a solid partnership within the Back 3 formation. ZicoZay: 3 – Quietly emerged as one of the best backs in the league; his speed allowed him to play deep into the offensive zone.